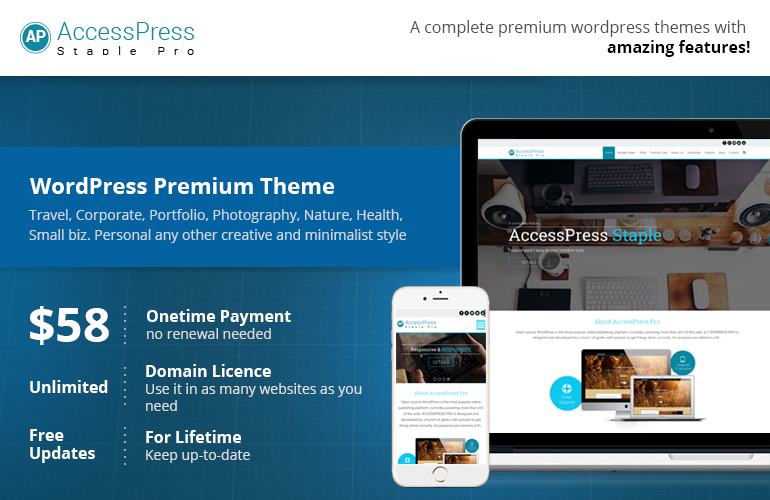 Get 20% off on the best multipurpose theme Accesspress Staple Pro. AccessPress Staple is a Premium WordPress Theme is complete theme with lots of useful feature,easy option to mange theme and modern look and feel. AccessPress Staple Pro is a fully SEO optimized and responsive on all devices. It is a brilliant multi purpose WordPress theme ! Travel, corporate, portfolio, photography, green thinking, nature, health, small biz, personal, any other creative and minimalist style website, corporate, agencies, bloggers anyone and everyone. 13+ widgets | FB like, Contact info, Flicker stream, Icon text block, image upload, media embed, preview post, progress bar, social icons, stat counter, team member, testimonial, toggle etc. Enable/disable full width, customized slug, grid/list view, customize column number, no. of characters for excerpt, select from pre defined styles. Show/hide featured image, configure featured image size, show/hide posted date, author, prev/next navigation. Add any custom CSS, user friendly editor! Add any custom JS, user friendly editor! You can have 4 pricing table you can have your own content there..